The new £1.35bn Queensferry Crossing could still be operating in 150 years, according to its technical director. Mike Glover, who has managed the bridge project for the decade since it was first approved, told the BBC its design would make it easy to maintain. 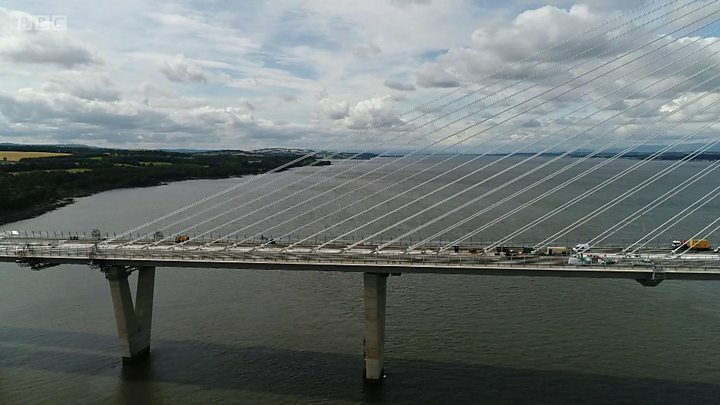 The new 1.7 miles (2.7km) crossing over the river Forth will open to traffic for the first time on Wednesday. It will take most of the vehicles that currently travel over the 53-year-old Forth Road Bridge. The existing suspension bridge will be adapted to be used by lighter traffic such as cycles, pedestrians and public transport. Mr Glover told the BBC Radio Four documentary Gordon Goes Forth that despite the Forth Road Bridge being replaced because of issues about its safety and reliability, it could last another 50 years if it was properly maintained. In the early hours of the morning, the Queensferry Crossing will fully open to traffic in both directions. Police will put in a place a rolling roadblock to stop traffic driving across the Forth Road Bridge and will redirect them across the Queensferry Crossing. The northbound carriageway will be opened first. The southbound carriageway will be opened about 45 minutes later. The bridge will be fully open to traffic for the rest of the day and the following day. Early in the morning, the Queensferry Crossing will close to all traffic. Police will redirect all vehicles back across the Forth Road Bridge. It will remain closed until the early hours of Wednesday morning. About 50,000 members of the public, who were given tickets after a ballot, will get a "once in a lifetime" chance to walk over the new bridge on Saturday and Sunday. The Queen will officially open the Queensferry Crossing. She will be joined by the Duke of Edinburgh. The Moderator of the General Assembly of the Church of Scotland will bless the bridge, and the Queen will cut a ribbon on the south side. A chance for a further 10,000 local people and school children to walk the bridge. The bridge will re-open to traffic, with no pedestrian access. The initial speed limit will be 40mph but after work has been completed to adapt the Forth Road Bridge public transport will be switched back to the old bridge and the Queensferry Crossing will become a 70 mph motorway. The current Forth Road Bridge opened in 1964 but a serious problem was found with corrosion of the wires inside its cables not long after its 40th birthday. The corrosion meant that the bridge's cables had already lost about 10% of their strength and it was forecast that it might not be able to take the heavy loads for much more than a decade. The decision to replace it was taken in 2007, with construction of the new crossing beginning in September 2011. Mr Glover, who has been the technical director of the Queensferry Crossing since 2007, calls it a "world class bridge" which will be around well into the 22nd Century. He said: "The length of time this bridge will be in position will be well in excess of 120 years - 150 years." The civil engineer said there were two main reasons for predicting such longevity. "The first is that the exterior of the bridge is a continuous structure - it is a box - which means the level of maintenance that is required is very minimal, unlike the trusses on the current suspension bridge," Mr Glover said. "The second is because the individual cables that make up the cable-stay bridge each one can be replaced without the stability of the bridge being in doubt. "Whereas with the suspension bridge any problem with that suspension cable means that the bridge would have to be closed." Despite the problems with the existing Forth Road Bridge, Mr Glover predicted it could survive for another 50 years now that it would be carrying lighter loads. He says: "It does require the maintenance regime to be maintained but with modern instrumentation we will know where to look for issues." The documentary Gordon goes Forth, presented by Gordon Brown, will be on BBC Radio Four at 20:00 on Monday 28 August.